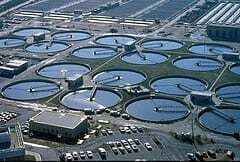 A new microbial fuel cell creates energy during wastewater treatment and also vastly reduces the amount of sludge produced. Israel-based company, Emefcy, named as a play on the acronym for microbial fuel cell (MFC), starts with the same principle as most wastewater treatment—water is aerated so bacteria in the liquid break down organic material in a closed series of containers known as a bioreactor. “We didn’t invent anything scientifically new,” says Ely Cohen, vice president of marketing and business development for the four-year-old company. The novelty factor: instead of using electricity to push air into the water, Emefcy uses a permeable filter that allows air in but doesn’t let liquid out, much like how a diaper works. The polyethylene plastic membrane, similar to materials used in construction, surrounds the fuel cell chamber into which wastewater flows. Inside the fuel cell, Emefcy coaxes anaerobic bacteria, primarily Shewanella oneidensis and Geobacter sulfurreducens, to release electrons in an oxygen-free environment. The electrons flow to an anode and then into a circuit to cathodes in a separate chamber on the outside of the membrane. The electrons allow the carbon cathodes to react with oxygen to form carbon dioxide. The practical side of the Emefcy fuel cell relates to the materials engineering: both the anode and cathode are made of a carbon cloth that acts as a conductor. Precious metals have long been used as conducting materials in batteries and other types of fuel cells but are too expensive to use at a commercial scale in microbial fuel cells. For a typical paper-recycling factory, one Emefcy fuel cell module, which is about the size of a cubic meter, could treat about three cubic meters per day of wastewater depending on the amount of organic material present, according to Cohen, and the modules can be scaled to meet the needs of larger or smaller plants. The bacteria eat a lot to produce electricity and live a longer life because the environment is optimized for their survival, so sludge can be cut down by 80 percent, Cohen says. Roughly four watts of electricity are produced for every kilogram of organic material that the bacteria consume. The amount of electricity generated will not exactly power the entire town, or even the entire processing facility, but it can offset the energy used to clean the water. “The energy we don’t consume is more important than the electricity we might produce,” says environmental engineer Bruce Logan of Pennsylvania State University, an Emefcy advisor.